After having seen the long lines for breakfast in the hotel over the weekend, I stocked in some provisions and enjoyed sleeping a few minutes later. I’m glad I did since the line to just get coffee was well over 60 people long when I passed by. The meeting has felt significantly more crowded today, although the conference center’s slightly wacky multi-level, multi-building layout helps spread things out. I’m also very pleased that there is plenty of seating throughout the common areas for those of us who want to get to know new friends, catch up with colleagues, or just take a break. 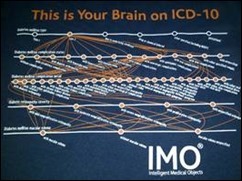 My morning session was a panel on “Harmonization of ICD-11 and SNOMED CT.” Yes, ICD-11. Experts have been working on it for years and particularly in how they plan to address some of the challenges in mapping between the two systems. Since mapping can lead to errors, they’re leaning towards a common framework of sorts that will make things better for those of us who have to use both systems. This is going to require some changes in how both systems are currently structured. However, it will reduce the need for crosswalks and therefore errors. It took owners of the two systems nearly three years to agree to a memorandum on collaboration and I’m sure it will take years to work it all out. I personally hope to be retired before it hits. Looking around the room, at least 10 percent of the people were using their phones or tablets to take pictures of the slides at one point or another. This really underscores the need to have the slides available to participants. At another conference I attended earlier this month, the presentations were linked to the entries in the conference application, which made it nice to follow along and to magnify slides that were difficult to read. So far, the didactic panels I have attended have featured 5-6 speakers giving mini-presentations on a main topic and that would help sort out who said what. I spent a little time in the exhibit hall, which was significantly less crowded today. Although there are a few vendor booths, there many booths representing various informatics training programs and graduate schools. I had a good conversation with IMO about their work not only in the US but with health systems in other countries. We’re all facing the same issues, but it sounds like there are many approaches to solutions. Having been a user of their tools embedded in several different vendors’ EHRs, I’m looking forward to their next generation of solutions to make physicians’ lives easier. Break service was again offered in the aisles of the exhibit hall, which made it crowded and difficult to move, especially with people stopping randomly to check their phones regardless of the people flowing behind them. My next session was a very-well attended one about the “Clinical Quality Framework Initiative to Harmonize Decision Support and Quality Measurement Standards.” Presentations (again in the multiple mini-talk format) included some of the federal initiatives via HHS to align various measurements and reporting systems. There was quite a bit of laughter when a slide was shown asserting a government mandate for “full interoperability” by 12/31/2018. In addition to aligning existing systems, though, the US government is also adding new metrics, such as the appropriate use criteria for advanced diagnostic imaging studies. Providers are going to be asked to document whether they’re using clinical decision support to avoid ordering expensive tests. Although this is a good thing at face value, I’d like to also see it coupled with a patient-facing program to educate patients on the fact that they don’t need these tests. Front-line physicians in the United States are constantly barraged by patients wanting the most high-tech (and often expensive) tests whether they need them or not. There is a cultural “need to know for sure” that something is or is not OK and patients see technical studies as the means to reach that end. In many cases, patients don’t want to play the odds or listen to statistics — they just want a test. If physicians don’t order the test and are insufficiently able to talk the patient away from it, our patient satisfaction scores suffer. We’ve seen this phenomenon with antibiotic use as well. 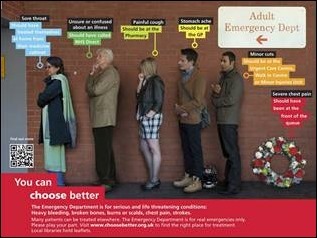 I’m a huge fan of how England’s NHS does it. They have many direct-to-consumer campaigns about how healthcare should work. I’ve included my favorite above. I attended a corporate member roundtable over the lunch hour. I’m not going to name the vendor because there were very few women in attendance and my cover might be blown. It was interesting to see where various participants were in their journey with informatics in general with specific kinds of technology. There was a nice mix of participants from research, training programs, large health systems, third-party firms, and end users. I tried to attend the ONC listening session that also occurred over the lunch hour but wasn’t able to register. Space was limited to 65 seats but the session was to include Chief Medical Information Officer Andrew Gettinger, Chief Health Information Officer Michel McCoy, and Chief Nursing Officer Rebecca Freeman. They were seeking specific feedback regarding the federal IT strategic plan, interoperability roadmap, precision medicine initiative, and other key initiatives. I’d be interested to hear from anyone that made the short list of cool kids attending. I spent some time after lunch cruising the poster presentations in the exhibit hall. 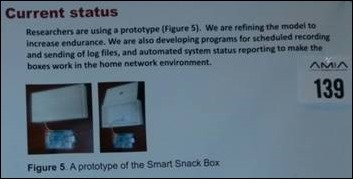 My favorite was one from a group in Japan, who created a “Smart Snack Box” system to record snacking behavior. They’re looking at the timing of meals on metabolism and how it impacts health and disease. Using Raspberry Pi technology and Python, they created a box that records how many times it is opened as a method of tracking snacking without patient self-reporting. Currently they’re limited because it only tracks the opening of the box, not the amount of snacks that were consumed or if the patient was only window shopping. I have a pre-teen nephew who is all about Python, so I sent it his way. Maybe there’s a future for him in biomedical research. The AMIA format lends itself well to session hopping and I did that a fair amount today. Topics included social media within consumer health informatics, natural language processing, precision medicine, patient portal use in safety net healthcare systems, and care team communication. Although intellectually stimulating, it is truly exhausting trying to attend all the presentations that grab my interest. There were a couple of social events tonight: the “Top of the World” Meet-up and Tweet-up and a movie premier for “No Matter Where,” which is a documentary following the journey of some of our field’s pioneers as well as how health information has impacted patients, providers, and other interested parties. I ended up opting instead for dinner with an old friend and former colleague who helped me stand up my first HIE way back when. Usually we only run into each other in the whirlwind that is HIMSS, so it was good to catch up in a lower key setting. We wound our way through Chinatown to the Marina District and various points in between and I’m grateful for him not making fun of my white knuckles on the near-vertical streets.